Godspower Oboido of Nigeria is a poet and cultural researcher. Critics have described his poetic voice as both matured and assured, comparable to the voices of Christopher Okigbo and Leopold Senghor, leading figures in African poetry and writers who have influenced Oboido’s work. Some regard Oboido as one of the most promising and distinguished contemporary poets representing the future of Nigerian literature. 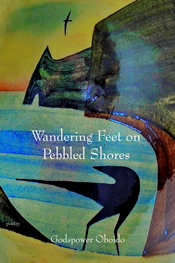 Wandering Feet on Pebbled Shores is his second book, following Songs of a Chicken Bone. His poetry has appeared in The Istanbul Review, The Indiana Voice Journal, African Writer and other literary journals.